Below is a list of all publications and presentations associated with our lab. Use the paper icon to read the abstract or the link button to find the electronic version of the publication. Amy N. W. Schnelle, Luke T. Richardson, Michael E. Pettit, Raul A.Villacob, Fengfei Wang, Erxi Wu, and Touradj Solouki, “Identification of Biomarkers for Glioblastoma in Saliva using Ion Mobility Mass Spectrometry”, Proceedings of the 66th ASMS Conference on Mass Spectrometry and Allied Topics 2018, San Diego, CA. Amy N. W. Schnelle, Luke T. Richardson, Michael E. Pettit, Sharon DeMorrow, and Touradj Solouki, “Influence of Hepatic Encephalopathy on Bile Acid Content in Brain Tissues of Rats and Mice”, Proceedings of the 66th ASMS Conference on Mass Spectrometry and Allied Topics 2018, San Diego, CA. Matthew R. Brantley, Ian G. M. Anthony, Raul A Villacob, Shihao Zhou, Touradj Solouki, “An Imaging FT-ICR Platform Utilizing Gallium Ablation for Biomolecule Analysis”, Proceedings of the 66th ASMS Conference on Mass Spectrometry and Allied Topics 2018, San Diego, CA. Matthew R. Brantley, Shihao Zhou, Ian G. M. Anthony, Raul A. Villacob, and Touradj Solouki, “Custom Mass Spectrometry Instrumentation: Best Practices”, Proceedings of the 66th ASMS Conference on Mass Spectrometry and Allied Topics 2018, San Diego, CA. Michael E. Pettit, Matthew R. Brantley, Amy N. W. Schnelle, and Touradj Solouki, “Use of Variable Wave Velocities for Identification of Ion Mobility Unresolved Species”, Proceedings of the 66th ASMS Conference on Mass Spectrometry and Allied Topics 2018, San Diego, CA. Luke Richardson, Michael E. Pettit, Amy N. W. Schnelle, Christina A. Gaw, Fabrizio Donnarumma, Kermit K. Murray, Sharon DeMorrow, and Touradj Solouki, “Tissue Sample Preparation Method for Simultaneous Isolation of Lipid and Protein Fractions and Untargeted MS and MS/MS Analyses”, Proceedings of the 66th ASMS Conference on Mass Spectrometry and Allied Topics 2018, San Diego, CA. Neural Networks”, Proceedings of the 66th ASMS Conference on Mass Spectrometry and Allied Topics 2018, San Diego, CA. Untargeted MS Analyses by Exact Mass and Isotopic Ratio Measurements”, Proceedings of the 66th ASMS Conference on Mass Spectrometry and Allied Topics 2018, San Diego, CA. Using CIU & CID”, Proceedings of the 66th ASMS Conference on Mass Spectrometry and Allied Topics 2018, San Diego, CA. Michael Spiegel, Ian G. M. Anthony, Matthew R. Brantley, Alton Hassell, Patrick Farmer, Touradj Solouki,”Investigating Asphaltene Structure Using Br-Tagging High-Resolution Mass Spectrometry and Paramagnetic Reduced NMR”, Proceedings of the 66th ASMS Conference on Mass Spectrometry and Allied Topics 2018, San Diego, CA. Kelin Wang, Fabrizio Donnarumma, Carson W. Szot, Michael E. Pettit, Touradj Solouki, and Kermit K. Murray, “MALDI MSI Directed Laser Ablation Tissue Microsampling with DIA Mass Spectrometry”, Proceedings of the 66th ASMS Conference on Mass Spectrometry and Allied Topics 2018, San Diego, CA. Retention Indices, EI-MS Fingerprints, and VUV Spectroscopic Signatures”, Proceedings of the 66th ASMS Conference on Mass Spectrometry and Allied Topics 2018, San Diego, CA. Fabrizio Donnarumma, Michael E. Pettit, Kelin Wang, Touradj Solouki, and Kermit K. Murray, “Proteomic Analysis of FFPE Tissue Using Laser Ablation Sampling”, Proceedings of the 66th ASMS Conference on Mass Spectrometry and Allied Topics 2018, San Diego, CA. Matthew Brantley; Ian G. M. Anthony; Raul A. Villacob; Carter Lantz; Adam R. Floyd; Christina A. Gaw; Scott Koziol; Touradj Solouki, “Development of an Imaging FT-ICR-MS with SIMS, FIB-SEM, and Post-Ionization Capabilities for Biological Applications”, Proceedings of the 65th ASMS Conference on Mass Spectrometry and Allied Topics 2017, Indianapolis, IN. Raul Villacob; Matthew R. Brantley; Ian G.M. Anthony; Touradj Solouki, “A Monte-Carlo Approach To Automated Ion Trajectory Calculations for Optimization of an Imaging FT-ICR MS with Post-Ionization Capabilities”, Proceedings of the 65th ASMS Conference on Mass Spectrometry and Allied Topics 2017, Indianapolis, IN. Ian G. M. Anthony; Matthew R. Brantley; Christina A. Gaw; Adam R. Floyd; Touradj Solouki, “Tandem Vacuum Ultraviolet Spectroscopy and Mass Spectrometry for Improved Identification of GC-Eluting Species”, Proceedings of the 65th ASMS Conference on Mass Spectrometry and Allied Topics 2017, Indianapolis, IN. Michael E. Pettit; Matthew R. Brantley; Fabrizio Donnarumma; Kermit K. Murray; Touradj Solouki, “Utilization of IM-MS Deconvolution for Reduced LC Separation Time Requirements in High-throughput Proteomics”, Proceedings of the 65th ASMS Conference on Mass Spectrometry and Allied Topics 2017, Indianapolis, IN. Carter Lantz; Matthew Brantley; James Chang ;Jeremy Sieker ;Sung-Joon Kim; Touradj Solouki, “Investigating the Pathways of Lipid Biosynthesis in reinhardtii under Nitrogen Starvation Conditions using Isotope Labeling and LC-MS”, Proceedings of the 65th ASMS Conference on Mass Spectrometry and Allied Topics 2017, Indianapolis, IN. Luke T. Richardson; Brooke A. Brown; Elyssia S Gallagher; Jules B. Puschett; Touradj Solouki, “Detection and Quantification of Bufadienolides in Complex Sample Mixtures using a nano-ESI-IM-MS Coupled to nano-UPLC”, Proceedings of the 65th ASMS Conference on Mass Spectrometry and Allied Topics 2017, Indianapolis, IN. Tara Liyanage; Matthew R Brantley; Touradj Solouki; Elyssia S Gallagher, “Comparative study of in-ESI, solution-phase, and gas-phase hydrogen/deuterium exchange for conformational analysis of carbohydrate-metal adducts”, Proceedings of the 65th ASMS Conference on Mass Spectrometry and Allied Topics 2017, Indianapolis, IN. Chao Dong; Kelin Wang; Fabrizio Donnarumma; Scott W. Herke; Michael E. Pettit; Touradj Solouki; Kermit K. Murray, “Combined Proteomic and RNA Expression Analysis of Laser Ablation Extracted Tissue”, Proceedings of the 65th ASMS Conference on Mass Spectrometry and Allied Topics 2017, Indianapolis, IN. Kelin Wang; Fabrizio Donnarumma; Carson W Szot; Michael E. Pettit; Touradj Solouki; Kermit K. Murray, “Infrared Laser Ablation Microsampling and Data Independent Acquisition Mass Spectrometry for Tissue Proteomics, Proceedings of the 65th ASMS Conference on Mass Spectrometry and Allied Topics 2017, Indianapolis, IN. Fabrizio Donnarumma; Michael E. Pettit; Touradj Solouki; Joshua D. Edwards ; Kermit K. Murray, “Laser Ablation Capture of Formalin Fixed Paraffin Embedded Tissue for LC-MS/MS Proteomics Analysis”, Proceedings of the 65th ASMS Conference on Mass Spectrometry and Allied Topics 2017, Indianapolis, IN. Michael E. Pettit; Raul A. Villacob; Matthew R. Brantley; Fabrizio Donnarumma; Kermit K. Murray; Touradj Solouki, “Infrared Laser Desorption Capture Coupled with Ion Mobility-Mass Spectrometry and Chemometric Deconvolution for Analysis of Biological Tissues”, Proceedings of the 65th ASMS Conference on Mass Spectrometry and Allied Topics 2017, Indianapolis, IN. Ian Anthony; Adam R. Floyd; Christina A. Gaw; Matthew R. Brantley; Touradj Solouki, “Characterization of Perfumes via Tandem Vacuum Ultraviolet Spectroscopy and Mass Spectrometry”, Proceedings of the 65th ASMS Conference on Mass Spectrometry and Allied Topics 2017, Indianapolis, IN. Touradj Solouki*; Matthew Brantley; Brett Harper; Michael Pettit, “Ion Mobility Peak Deconvolution for High Throughput X-omics Mass Spectrometry”,72nd Annual American Chemical Society Southwest Regional Meeting, 2016, San Antonio, TX. Carter Lantz*; Jeremy Sieker; Matthew Brantley; Alireza Abdolvahabi; James Chang; Sung-Joon Kim; Touradj Solouki, “Investigating the Mechanism of Lipid Body Obesity in C. reinhardtii under Nitrogen Starvation Conditions using High Resolution Mass Spectrometry”, Rice University Gulf Coast Undergraduate Research Symposium, 2016, Houston, TX. Adam Floyd*; Ian Anthony; Matthew Brantley; Christina Gaw; Touradj Solouki, “Improved Compound Identification Utilizing a Complementary Vacuum Ultraviolet Spectroscopy/Mass Spectrometry Library-Matching Approach”, Rice University Gulf Coast Undergraduate Research Symposium, 2016, Houston, TX. Christina Gaw*; Ian Anthony; Matthew Brantley; Adam Floyd; Touradj Solouki “Analysis of Closely Related Volatile Organic Compounds with a Gas Chromatography-Vacuum Ultraviolet-Mass Spectrometry System”, Rice University Gulf Coast Undergraduate Research Symposium 2016, Houston, TX. Fabrizio Donnarumma; Michael E Pettit; Touradj Solouki; Kermit K Murray, “Tandem Mass Spectrometry of Laser Ablation Sampled Tissue”, Proceedings of the 64th ASMS Conference on Mass Spectrometry and Allied Topics 2016, San Antonio, TX. Touradj Solouki*; Matthew Brantley; Brett Harper, Michael Pettit, Brooke Brown, “Advantages of Ion Mobility Peak Deconvolution for Multidimensional Mass Spectrometry Characterization of Complex Sample Mixtures in X-omics Studies”, Waters users meeting”, Proceedings of the 64th ASMS Conference on Mass Spectrometry and Allied Topics 2016, San Antonio, TX. Fabrizio Donnarumma; Michael E. Pettit; Touradj Solouki; Kermit Murray, “Localized Laser Ablation Sample Transfer for Tissue Proteomics”, Pittsburgh Conference, 2016, Atlanta, GA.
Michael Spiegel*; Ian Anthony; Matthew Brantley; Alton Hassell; Claire Moffett; Subin Yoon; Marie Stephensen; Patrick Farmer; Touradj Solouki, “Kendrick Mass Defect Visualization of Asphaltenes Pre- and Post-Reaction with Bromine”, Proceedings of the 64th ASMS Conference on Mass Spectrometry and Allied Topics 2016, San Antonio, TX. Matthew R Brantley*; Solouki Touradj, “A Modular Data Station for Radio-Frequency Ionization FT-ICR Mass Spectrometry Built on Robust and Expandable Commercial Architectures for Imaging Applications”, Proceedings of the 64th ASMS Conference on Mass Spectrometry and Allied Topics 2016, San Antonio, TX. Michael E Pettit*; Matthew R Brantley; Touradj Solouki, “Rapid Ion Mobility Deconvolution for High-throughput Analysis of Structural Isomers”, Proceedings of the 64th ASMS Conference on Mass Spectrometry and Allied Topics 2016, San Antonio, TX. Brett Harper; Brooke Brown*; Touradj Solouki, “Rapid Profiling of Cellular Extracts Using Ion Mobility-Mass Spectrometry”, Proceedings of the 64th ASMS Conference on Mass Spectrometry and Allied Topics 2016, San Antonio, TX. Carter Lantz*; Ryan Rho; Jeremy Sieker; Matthew Brantley; Alireza Abdolvahabi; James Chang; Sung-Joon Kim; Touradj Solouki, “Investigating the Mechanism of Lipid Body Obesity in C. reinhardtii under Nitrogen Starvation Conditions using High Resolution Mass Spectrometry”, Proceedings of the 64th ASMS Conference on Mass Spectrometry and Allied Topics 2016, San Antonio, TX. Matthew Brantley; Michael Pettit; Brett Harper; Brooke Brown; Touradj Solouki*, “Peak Width Analysis for Automated Detection of Unresolved Isomers in Ion Mobility”, Proceedings of the 64th ASMS Conference on Mass Spectrometry and Allied Topics 2016, San Antonio, TX. Fabrizio Donnarumma1; Michael E Pettit2; Touradj Solouki2; Kermit K Murray1, “Liquid Chromatography High Resolution Tandem Mass Spectrometry of Laser Ablation Sampled Tissue”, 1-Louisiana State University, Baton Rouge, LA; 2-Baylor University, Waco, TX Proceedings of the 64th ASMS Conference on Mass Spectrometry and Allied Topics 2016, San Antonio, TX. Ian G. M. Anthony*; Matthew R Brantley; Adam R Floyd; Abayomi D. Olaitan; Deniz A Erdogan; Emrah Özensoy; Touradj Solouki, “Unambiguous Identification of Reaction Products from Conversion of Nitric Oxide over Novel Photocatalyst Surfaces” Proceedings of the 64th ASMS Conference on Mass Spectrometry and Allied Topics 2016, San Antonio, TX. Harper, B.; Lochridge, J.; Solouki, T. “Spray Pump Ionization: A Simple-to-Use and Low Cost Ionization Technique for Regulatory and Formulation Mass Spectrometry Analysis of Pharmaceuticals” Pan Africa Chemistry Network (PACN) Congress 2015 – Healthcare: From Discovery to Delivery, 2015, Nairobi, Kenya. Harper, B.; Solouki, T. “Saliva Characterization for Non-invasive and Rapid Biomarker Analysis Using Ion Mobility-Mass Spectrometry” Pan Africa Chemistry Network (PACN) Congress 2015 – Healthcare: From Discovery to Delivery, 2015, Nairobi, Kenya. Lu, W.; Zekavat, B.; Olaitan, A. D.; Brantley, M.; Erdogan, D. A.; Ozensoy, E.; Solouki, T. “A Cryofocuser/Quadrupole Mass Spectrometer Coupled to a Catalysis Unit for Detection of Nitrogen Oxide Catalysis Products”, Proceedings of the 63rd ASMS Conference on Mass Spectrometry and Allied Topics 2015, St. Louis, MO. Kelin Wang1; Octavia Y. Goodwin1; Fabrizio Donnarumma1; Behrooz Zekavat2; Touradj Solouki2; Megan A. Macnaughtan1; Kermit K. Murray1; 1Louisiana State Univeristy, Baton Rouge, LA; 2Baylor Univeristy, Waco, TX, “O-GlcNAc Modification Site-Specific Characterization of ABL2 Produced from a ΔNagZ E. coli Co-Expression System by Tandem Mass Spectrometry”, Proceedings of the 63rd ASMS Conference on Mass Spectrometry and Allied Topics 2015, St. Louis, MO. Brett Harper; Elizabeth Neumann; Touradj Solouki, “Extracting Collision Cross-sections of Ion Mobility Unresolved Isomers Using Tandem Mass Spectrometry and Chemometric Deconvolution”, Proceedings of the 63rd ASMS Conference on Mass Spectrometry and Allied Topics 2015, St. Louis, MO. Brantley, M.; Olaitan, A. D.; Solouki, T. “Laser Desorption Radio-Frequency Ionization (LD RFI)”, Proceedings of the 63rd ASMS Conference on Mass Spectrometry and Allied Topics 2015, St. Louis, MO. Olaitan, A. D.; Zekavat, B.; Brantley, M.; Solouki, T. “Performance Characterization of a Unique Radio-Frequency Ionization Source” Proceedings of the 63rd ASMS Conference on Mass Spectrometry and Allied Topics 2015, St. Louis, MO. Neumann, E. K.; Harper, B.; Solouki, T. “Phosphopurine Ion Formation Upon Collision Induced Dissociation of DNA Oligonucleotides” 2015 Chemistry and Biochemistry Undergraduate Research Symposium, 2015, Waco, TX. Neumann, E. K.; Hancock, S.; Solouki, T. “Utilizing Optical Spectroscopy for Detection of Recombinant Streptolysin O” 2015 Chemistry and Biochemistry Undergraduate Research Symposium, 2015, Waco, TX. Olaitan, D.; Brantley, M.; Lantz, C.; Solouki, T. “Radio Frequency Ionization Desorption of Silicon Insulating Sleeves” 2015 Chemistry and Biochemistry Undergraduate Research Symposium, 2015, Waco, TX. Brantley, M. R.; Zekavat, B.; Olaitan, A. D.; Solouki, T. “Inexpensive, Programmable, and Modular Radio-Frequency Power Supplies for Mass Spectrometers” Pittsburgh Conference, 2015, New Orleans, LA. Harper, B.; Lochridge, J.; Solouki, T. “Spray Pump Ionization Mass Spectrometry of Pharmaceutical, Peptide, and Protein Ions” Pittsburgh Conference, 2015, New Orleans, LA. Pettit, M. E.; Harper, B.; Brantley, M. R.; Solouki, T. “Collision-Energy Resolved Ion Mobility Deconvolution of a Ternary Isomeric Mixture” Pittsburgh Conference, 2015, New Orleans, LA. Olaitan, A. D.; Zekavat, B.; Solouki, T. “Electron Generation in Radio Frequency Ionization” Pittsburgh Conference, 2015, New Orleans, LA. Harper, B.; Neumann, E. K.; Solouki, T. “Improving Sequence Coverage of Ion Mobility Unresolved Peptide Isomers Using Chemometric Data Deconvolution” Pittsburgh Conference, 2015, New Orleans, LA. McCulloch, M.; Miladi, M.; Broffman, M.; Solouki, T. “Don’t Ask, Don’t Tell: Pesticide Residues and Patient Risks in Chinese Herbal Medicines”11th International Conference of the Society for Integrative Oncology,2014, Houston, TX. Harper, B.; Brantley, M.; Pettit, M.; Solouki, T. “Automated Collision Cross Section Calculation for Traveling Wave Ion Mobility Spectrometry Instruments” Proceedings of the 62nd ASMS Conference on Mass Spectrometry and Allied Topics, 2014, Baltimore, MD. Harper, B.; Neumann, E. K.; Olaitan, A. D.; Solouki, T. “Sequence-scrambling in Collision-Induced Dissociation of Oligonucleotides” Proceedings of the 62nd ASMS Conference on Mass Spectrometry and Allied Topics, 2014, Baltimore, MD. Zekavat, B.; Harper, B.; Brantley, M.; Pettit, M. E.; Solouki, T. “Use of Multivariate Curve Resolution and Ion Mobility-Mass Spectrometry for Isomer Differentiation” Proceedings of the 62nd ASMS Conference on Mass Spectrometry and Allied Topics, 2014, Baltimore, MD. Olaitan, A. D.; Zekavat, B.; Solouki, T. “Ionization Mechanism in Radio-Frequency Ionization (RFI)” Proceedings of the 62nd ASMS Conference on Mass Spectrometry and Allied Topics, 2014, Baltimore, MD. Harper, B.; Zekavat, B.; Brantley, M.; Pettit, M. E.; Solouki, T. “Energy Resolved Ion Mobility Deconvolution of Isobaric Compounds” Proceedings of the 62nd ASMS Conference on Mass Spectrometry and Allied Topics, 2014, Baltimore, MD. Miladi, M.; Olaitan, A. D.; Zekavat, B.; Lochridge, J.; Solouki, T. “Effect of Metal Ion and Neutral Reagent Type on Gas-Phase Adduct Formation” Proceedings of the 62nd ASMS Conference on Mass Spectrometry and Allied Topics, 2014, Baltimore, MD. Neumann, E. K.; Fontenot, S.; Zekavat, B.; Mowery, R.; Solouki, T. “Mass Spectrometry and Enhanced Chemiluminescent Western Blot Analysis of Recombinant Streptolysin O” 69thSouthwest Regional Meeting of the American Chemical Society, 2013, Waco, Texas. Zekavat, B.; Olaitan, A. D.; Solouki, T. “Analysis of Volatile Organic Compounds in Gasoline Samples Using Radio-Frequency Ionization/Mass Spectrometry”Proceedings of the 61st ASMS Conference on Mass Spectrometry and Allied Topics, 2013, Minneapolis, MN. Wang, T.; Jupiter, D.; Devkota, L.; Chambliss, C. K.; Pinney, K.; Solouki, T. “Identification of Sulfur Compounds in Petroleum Samples Using Derivatization with Mass Deficient Reagents” 61st Annual American Society for Mass Spectrometry Conference, 2013, Minneapolis, Minnesota. Miladi, M.; Harper, B.; Solouki, T. “Sequence Scrambling in Collision-Induced Dissociation of y-Type Fragment Ions” 61st Annual American Society for Mass Spectrometry Conference, 2013, Minneapolis, MN. 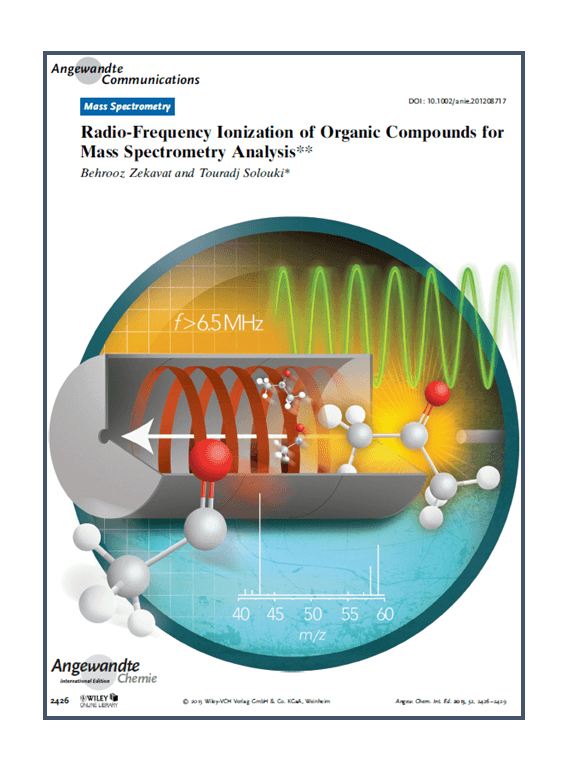 Zekavat, B.; Olaitan, A. D.; Solouki, T. “A Novel Radiofrequency Ionization Method for the Analysis of Wide Classes of Volatile Organic Compounds” Proceedings of the 61st ASMS Conference on Mass Spectrometry and Allied Topics, 2013, Minneapolis, MN. Zekavat, B.; LaBrecque, D.; Solouki, T. “Coupling Post-Column Cryogenic Trapping with Conventional GC/MS for the Analysis of Volatile Organic Compounds” Proceedings of the 61st ASMS Conference on Mass Spectrometry and Allied Topics, 2013, Minneapolis, MN. Solouki, T.; Olaitan, A. D.; Zekavat, B.; LaBrecque, D. “Coupling Post-Column Cryogenic Trapping with Conventional GC/MS for the Analysis of Volatile Organic Compounds” Proceedings of the 61st ASMS Conference on Mass Spectrometry and Allied Topics, 2013, Minneapolis, MN. ontenot, S.; Miladi, M.; Solouki, T. “Probing the Structural Variations of a Metal-Complexed Model Peptide Using Post-Ion Mobility/Collision-Induced Dissociation Mass Spectrometry” Baylor University Summer Undergraduate Research and Scholarly Achievement, 2013, Waco, TX. Harper, B.; Miladi, M.; Olaitan, D.; Zekavat, B.; Solouki, T. “Biomedical “X-Omics” Research” Enhancing Research Through Collaboration Retreat, 2013, Waco, TX. Harper, B.; Zekavat, B.; Solouki, T. “Human Neutrophil α-Defensins as Potential Stress Biomarkers” Baylor University Summer Undergraduate Research and Scholarly Achievement, 2013, Waco, TX. Zekavat, B.; Miladi, M.; Ramirez, A. J.; Olaitan, D. A. “Ultrahigh Resolution Analysis of Emerging Contaminants in Complex Sample Mixtures with Fourier Transform Mass Spectrometers and Kendrick Plots” Proceedings of the 243th American Chemical Society (ACS) National Meeting, 2012, San Diego, CA. Zekavat, B.; Solouki, T. “Placebo’ Response/Effect: Characterization at the Molecular-Level” 18th Beach Tree Labs Annual Meeting, 2011, Albany, NY. Zekavat, B.; Solouki, T. “The Use of Novel Ionization Techniques, Theoretical Ion Trajectory Calculations, and New Separation Approaches for Analyzing Complex Biological Samples in Placebo Studies” 17th Beach Tree Labs Annual Meeting, 2010, Albany, NY. Zekavat, B.; Solouki, T. “Injection of Externally-Generated Low Mass Ions into High Magnetic Field in Q/FT-ICR Instruments: SIMION Simulations and Experimental Observations” Proceedings of the 58th ASMS Conference on Mass Spectrometry and Allied Topics, 2010, Salt Lake City, UT. Solouki, T.; Zekavat, B.; Miladi, M. “On the Existence of Structurally Different Isobaric bn Fragment Ions” Proceedings of the 58th ASMS Conference on Mass Spectrometry and Allied Topics, 2010, Salt Lake City, UT. Solouki, T.; Zekavat, B. “Proton Affinity-based Kendrick Plots: A 3D Graphical Visualization of ESI/FT- ICR Mass Spectra of Crude Oils” 238th ACS National Meeting, 2009, Washington, DC. Solouki, T.; Rasaiah, J. C; Szulejko, J. E.; Silwal, I. K. “Characterization of Petroleum Samples by GC/FT-ICR MS” 238th ACS National Meeting, 2009, Washington, DC. Al-Fdeilat, A. H.; Zekavat, B.; Collins, S. D.; Smith, R.; Solouki, T. “Characterization of a Microfabricated Electrospray Ionization (ESI) Device for Solution-Phase H/D Exchange in Non-Denaturing Media” 57th ASMS Conference on Mass Spectrometry and Allied Topics, 2009, Philadelphia, PA.
Zekavat, B.; Al-Fdeilat, A. H.; Solouki, T. “Gas-Phase Basicity Measurements of Singly- and Doubly-Charged bn Fragment Ions Using ESI/FT-ICR MS” 57th ASMS Conference on Mass Spectrometry and Allied Topics, 2009, Philadelphia, PA.
Szulejko, J. E.; Zekavat, B.; LaBrecque, D.; Solouki, T. “Low Cost Higher Frequency RF Power Supplies for Quadrupole Ion Guides in FT-ICR Instruments with External Ion Sources” 57th ASMS Conference on Mass Spectrometry and Allied Topics, 2009, Philadelphia, PA.
Silwal, I.; Rasaiah, J. C.; Solouki, T. “Multidimensional Analysis of Environmental Samples: Gas Chromatography/Fourier Transform Ion Cyclotron Resonance Mass Spectrometry and Ab-Initio Calculations” Proceedings of the 56th ASMS Conference on Mass Spectrometry and Allied Topics,2008, Denver, CO.
Silwal, I.; Luo, Z.; Rasaiah, J. C.; Solouki, T. “Gas Chromatography/Fourier Transform Ion Cyclotron Resonance Mass Spectrometry and Ab-Initio Proton Affinity Calculations of Hydrocarbon Isomers in Petroleum”Proceedings of the 236th American Chemical Society (ACS) National Meeting, Division of Petroleum Chemistry,2008, Philadelphia, PA.
Al-Fdeilat, A. H.; Zekavat, B.; Dhake, P.; Vaino, A.; Solouki, T. “Kinetic Studies and Determination of Proton Affinity Differences with ESI/FT-ICR MS to Investigate the “Reverse Anomeric Effect” in Gas Phase” Proceedings of the 56th ASMS Conference on Mass Spectrometry and Allied Topics,2008, Denver, CO.
Solouki, T.; McCulloch, M. F.; Szulejko, J. E. “Using FT-ICR Mass Spectrometry for Identification and Screening of Cancer Biomarkers: Potential for Comprehensive Monitoring of Disease Treatment at the Molecular Level” GTCbio 5th Cancer Drugs Research & Development Conference, 2008, Phoenix, AZ. Szulejko, J. E.; Zekavat, B.; Solouki, T. “Improving the Performance of a GC/FT-ICR MS Using an External EI/CI Ion Source” Proceedings of the 56th ASMS Conference on Mass Spectrometry and Allied Topics,2008, Denver, CO.
Zekavat, B.; Al-Fdeilat, A. H.; Solouki, T. “Site-specific determination of deuterium incorporation in brakykinin by electron capture dissociation and collision induced dissociation” Proceedings of the 236th American Chemical Society (ACS) National Meeting, 2008, Philadelphia, PA.
Peckenham, J.; Lipfert, G.; Tolman, A.; Solouki, T.; Silwal, I. “The Spatial Variability of Disinfection By-Products (DBPs) Relative to Regional Chemical Gradients” Water Quality Technical Conference AWWA Symposium on Emerging Issues in Source Water Protection, 2008, Cincinnati, OH. Solouki, T.; Szulejko, J. E.; Silwal, I.; Heffner, C. “Experimental and Theoretical Approaches: Identification of Disinfection By-Products in Drinking Water with Multidimensional GC/FT-ICR MS” Proceedings of the 54th ASMS Conference on Mass Spectrometry and Allied Topics, 2006, Seattle, WA. Solouki, T.; Silwal, I.; Heffner, C.; Peckenham, J. “Emerging Technologies for Sample-printing and Identification of Disinfection By-Products in Drinking Water: Multidimensional GC/FT-ICR Mass Spectrometry” Drinking Water Disinfection By-Products (Gordon Conference),2006, South Hadley, MA. Szulejko, J. E.; Luo, Z.; Solouki, T. “Simultaneous Determination of Analyte Concentrations and Proton Affinities in GC/FT-ICR Mass Spectrometry” Proceedings of the 53rd ASMS Conference on Mass Spectrometry and Allied Topics, 2005, San Antonio, TX. Solouki, T.; Szulejko, J. E.; Luo, Z. “Multidimensional GC Fourier Transform Ion Cyclotron Resonance Mass Spectrometry: Resolving Complex Mixtures” Proceedings of the 52nd ASMS Conference on Mass Spectrometry and Allied Topics, Nashville, 2004, TN. Mocanu, V.; Graham, L. B.; Neamati, N.; Solouki, T.; Petrotchenko, E. V.; Borchers, C. H. “Top-down and Bottom-up Mass spectrometry Combined with Photoaffinity Labeling for Structural Characterization of Drug Binding Sites in HIV-Integrase” Proceedings of the 52nd ASMS Conference on Mass Spectrometry and Allied Topics, 2004, Nashville, TN. Bennett, J. B.; Graham, L. B.; Szulejko, J. E.; Solouki, T. “Differential of Terpene Isomers Based on Unimolecular and Ion-Molecule Reactions” 4th North American FT-ICR Conference, 2003, Marshall, CA. Szulejko, J. E.; Bennett, J. B.; Graham, L. B.; Solouki, T. “Kinetic Analysis of Metastable Decay and Ion-molecule Reactions for Selected Terpene Isomers: Cold and Hot Ions” Proceedings of the 51st ASMS Conference on Mass Spectrometry and Allied Topics, 2003, Montréal, QC, Canada. Bennett, J. B.; Graham, L. B.; Szulejko, J. E.; Solouki, T. “Differentiation of Selected Terpene Isomers Based on Metastable Decay and Ion-molecule Reactions: Long-lived Excited States” 4th North American FT-ICR Conference, Marconi Conference Center, 2003, Marshall CA. Fattahi, A.; Solouki, T. “Comparison of Conformational Variations Induced by Metal Complexation and b Type Fragmentation for Peptides with Acidic- and Basic-Side Chains: Gas-Phase H/D Exchange and Kinetic Studies” Proceedings of the 51st ASMS Conference on Mass Spectrometry and Allied Topics, Bioinformatics Session, 2003, Montreal, QC, Canada. Szulejko, J. E.; Bennett, J. B.; Graham, L. B.; Solouki, T. “Kinetic Analysis of Metastable Decay and Ion-molecule Reactions for Selected Terpene Isomers: Cold and Hot Ions” Proceedings of the 51st ASMS Conference on Mass Spectrometry and Allied Topics, Bioinformatics, 2003, Montreal, QC, Canada. Fattahi, A.; Solouki, T. “Identification of Different Conformers of a Neuropeptide and Study of its Metal-induced Conformational Variations Using Gas Phase H/D Exchange”Proceedings of the American Chemical Society (ACS) National Meeting, Physics: Neutron Scattering and Biophysical Chemistry,2002, Boston, MA. Fredrick, G.; Solouki, T.; Riker, R.; Lad, R. J. “Breath Diagnostic Sensors as a Triage Tool For Pathogen Exposure” AVS Topical Conference On Understanding and Operating In Threat Environments, 2002, Monterey, CA. Arehart, E.; Fattahi, A.; Patterson, H. H.; Fort, R. C. Jr.; Solouki, T. “Fluorescence Quenching, Mass Spectral H/D Exchange and Ion Fragmentation Studies of trp-his-trp-leu-g1n-leu upon Metal-complexation” Proceedings of the American Chemical Society (ACS) National Meeting, Physics: Neutron Scattering and Biophysical Chemistry, 2002, Boston, MA. Solouki, T.; Szulejko, J. E. “Biomedical and Environmental Applications of a Preconcentrator Coupled to a Gas Chromatograph Fourier Transform Ion Cyclotron Resonance Mass Spectrometer” Proceedings of the 50th ASMS Conference on Mass Spectrometry and Allied Topics, Bioinformatics, 2002, Orlando, FL. Fattahi, A.; Solouki, T. “Using Gas-phase H/D Exchange Reactions to Identify Different Fragment Ion Conformers” Proceedings of the 50th ASMS Conference on Mass Spectrometry and Allied Topics, Clinical Chemistry, 2002,Orlando, FL. Szulejko, J. E.; Solouki, T. “High Resolution Biomarker Identification in Human Exhaled Breath of Smokers and Non-Smokers, and Cigarette Smoke: Connectivities to Chronic Obstructive Pulmonary Disease (COPD)” Proceedings of the 50th ASMS Conference on Mass Spectrometry and Allied Topics, Clinical Chemistry, 2002, Orlando, FL. Solouki, T.; Lad, R. J. “Nitric Oxide Sensor for Early Detection of Pathogenic Exposure: FT-ICR Analyses of Exhaled Human Breath for Disease Diagnosis” Tissue Based Biosendors & Advanced Diagnostics: DARPA Principal Investigator’s Conference, 2001, San Diego, CA. Solouki, T.; Szulejko, J. E. “Gas Chromatography and Fourier Transform Ion Cyclotron Resonance Mass Spectrometry: Analyzing Complex Sample Mixtures” Invited Symposium: Oral Platform, Developments in Mass Spectrometry B., Instrumentation Presentation,2001, Durham, NH. Solouki, T.; Szulejko, J. E. “Fingerprinting Complex Biological and Environmental Samples: Biomarkers Identification with a High Performance Mass Spectrometer” New Investigators in Analytical Science: Innovative Leaders in the New Millennium: FACSS Meeting, 2001, Detroit, MI. Solouki, T.; Szulejko, J. E. “Coupling a Gas Chromatograph to a Fourier Transform Ion Cyclotron Resonance Mass Spectrometer: Biological and Environmental Mass Spectrometry” Proceedings of the 49th ASMS Conference on Mass Spectrometry and Allied Topics, 2001, Chicago, IL. Szulejko, J. E.; Solouki, T. “The Use of Ultra-high Resolution Fourier Transform Ion Cyclotron Resonance Mass Spectrometry for Rapid Detection and Identification of Various Species in Human Exhaled-Breath: Disease Diagnosis” Proceedings of the 49th ASMS Conference on Mass Spectrometry and Allied Topics, 2001, Chicago, IL. Stemmler, E. A.; Segovis, C.; Solouki, T. “The Reactions of O-. and OH- with Diesters of Aliphatic Dicarboxylic Acids Using NICI and FT-ICR MS” Proceedings of the 49th ASMS Conference on Mass Spectrometry and Allied Topics, 2001, Chicago, IL. Fattahi, A.; Solouki, T. “Conformational Analysis of Metal Complexed Model Peptides and Their Fragment Ions Using FT-ICR MS and Gas-Phase H/D Exchange Reactions” Proceedings of the 49th ASMS Conference on Mass Spectrometry and Allied Topics, 2001, Chicago, IL. Fattahi, A.; Solouki, T. “Novel Method for Simultaneous Determination of Reaction Parameters: A Key to Unravel the Complicated Chemical Systems” Proceedings of the 220th American Chemical Society (ACS) National Meeting, 2000, Washington, D.C.
Shoven, H. A.; Anderson, T.; Kahl, S.; Mower, B. F.; Patterson, H. H.; Solouki, T. “Monitoring Dioxin Levels in Maine Rivers with Semipermeable Membrane Devices” The Gordon Research Conference on Environmental Sciences: Water, 2000, Plymouth, NH. Shoven, H. A.; Anderson, T.; Kahl, S.; Mower, B. F.; Patterson, H. H.; Solouki, T. “Monitoring Dioxin Levels in Maine Rivers with Semipermeable Membrane Devices” The 6th International SPMD Workshop and Symposium,2000, Columbia, MO. Shoven, H. A.; Anderson, T.; Kahl, S.; Mower, B. F.; Patterson, H. H.; Solouki, T. “Monitoring Dioxin Levels: Determining Compliance with Maine’s Upstream-Downstream Law” Northeast Regional Meeting for the National Council for Air and Stream Improvement, 2000, Portsmouth, NH. Stemmler, E. A.; Yoshida, E. M.; Pacheco, J. M.; Woodbury, E. D.; Solouki, T. “The Reactions of O-. with Alkyl and Aryl Esters of Benzoic Acid: An NICI and FT-ICR Study” Proceedings of the 48th ASMS Conference on Mass Spectrometry and Allied Topics, 2000, Long Beach, CA. Solouki, T.; Fort, R. C. Jr.; Alomary, A.; Fattahi, A. “Gas-phase Hydrogen Deuterium Exchange Reactions of Model Peptides: Conformational Analyses by FT-ICR” Proceedings of the 48th ASMS Conference on Mass Spectrometry and Allied Topics, 2000, Long Beach, CA. Alomary, A.; Solouki, T. “Combined External and Internal Ion Accumulation: Improved Detection Limit for Electrospray Ionization Fourier Transform Ion Cyclotron Resonance Mass Spectrometry” Proceedings of the 48th ASMS Conference on Mass Spectrometry and Allied Topics, 2000, Long Beach, CA. Solouki, T. “Applications of High Performance Mass Spectrometers for Structural Analysis of Complex Biological/Environmental Macromolecules” The 5th European FTMS Workshop, 1999, Warwick, UK. Solouki, T.; Alomary, A. “Chemical Reactions of Fulvic Acids with Environmental Pollutants at the Molecular Level: An ESI FT-ICR Study of Chemical Reactions of Fulvic Acids” Proceedings of the 47th ASMS Conference on Mass Spectrometry and Allied Topics, 1999, Dallas, TX. Kleckley, S.; Wang, H.; Oladeji, I.; Chow, L.; Daly, T. K.; Buseck, P. R.; Solouki, T.; Marshall, A. G. “Fullerenes and Polymers Produced by the Chemical Vapor Deposition Method” Proceedings of the American Chemical Society (ACS) National Meeting, 1998, Washington, D.C.
Solouki, T.; Freitas, M. A.; Alomary, A. “Electrospray Ionization Fourier Transform Ion Cyclotron Resonance (FTICR) Mass Spectrometry of Fulvic Acids: Gas-phase Probing of Aluminum-Fulvic Acid Complexation” Proceedings of the 216th American Chemical Society (ACS) National Meeting, 1998, Boston, MA. Solouki, T.; Floreto, E.; Alomary, A.; Bayer, R. “Characterization of Lobster Chemoattractants: Better Baits” Proceedings of the 46th ASMS Conference on Mass Spectrometry and Allied Topics, 1998, Orlando, FL. Alomary, A.; Anderson, T.; Kahl, S.; Solouki, T. “Development of Mass Spectral Methods to Lower Detection Limits for Analysis of Environmental Pollutants” Proceedings of the 46th ASMS Conference on Mass Spectrometry and Allied Topics, 1998, Orlando, FL. Naito, Y.; Gaskell, S. J.; Solouki, T.; Hendrickson, C. L.; Marshall, A. G. “FTICR Investigation of gas-phase rearrangements of protonated peptides” Proceedings of the 14th International Mass Spectrometry Conference, 1997, Tampere, Finland. Xu, M.; Solouki, T.; Marshall, A. G.; Dougherty, R. C. “Ion Polar Molecule Collisions and Reactions” Proceedings of the 45th ASMS Conference on Mass Spectrometry and Allied Topics, 1997, Palm Springs, CA. Naito, Y.; Gaskell, S. J.; Solouki, T.; Hendrickson, C. L.; Marshall, A. G. “Energetic Study of the C-terminal Rearrangement of Protonated Peptides Using FTICR” Proceedings of the 45th ASMS Conference on Mass Spectrometry and Allied Topics, 1997, Palm Springs, CA. Solouki, T.; Fievre, A.; Marshall, A. G.; Cooper, W. T. “High Resolution Multistage (MSn) Electrospray Ionization Fourier Transform Ion Cyclotron Resonance Mass Spectrometry of Humic And Fulvic Acids” Proceedings of the 45th ASMS Conference on Mass Spectrometry and Allied Topics, 1997, Palm Springs, CA. Naito, Y.; Gaskell, S. J.; Solouki, T.; Hendrickson, C. L.; Marshall, A. G. “Gas-phase Intrinsic Behavior of Singly Protonated Bradykinin in an FTICR Ion Trap” Proceedings of the 45th ASMS Conference on Mass Spectrometry and Allied Topics, 1997, Palm Springs, CA. Emmett, M. R.; Conard, C. A.; Solouki, T.; Marshall, A. G. “Cytokine Analysis by High Resolution FT-ICR Mass Spectrometry” Society for Neuroscience, 1996, Washington D.C.
Solouki, T.; Reinhold, B. B.; Costello, C. E.; O’Malley, M.; Guan, S.; Marshall, A. G. “Structural Analysis of Polysaccharides and Peptides by MALDI FT-ICR MS” Proceedings of the ACS, 1996, Orlando, FL. Cooper, W. T.; Fievre, A.; Solouki, T.; Marshall, A. G. “Characterization of Aquatic Humic Substances, Part 2. FT-ICR Mass Spectrometry” Proceedings of the ACS, 1996, Orlando, FL. Solouki, T.; Guan, S.; Paša-Tolić, L.; Marshall, A. G. “Detection of Disulfide Bonding in Peptides by MALDI FT-ICR” Proceedings of the 47th Pittsburgh Conference, 1996, Chicago, IL. Solouki, T.; Paša-Tolić, L.; Marshall, A. G. “Structure Elucidation of Peptides by Matrix-assisted Laser Desorption/Ionization Two-Dimensional FT-ICR MS/MS” Proceedings of the 47th Pittsburgh Conference, 1996, Chicago, IL. Emmett, M. R.; Solouki, T.; Marshall, A. G. “MALDI FT-ICR Mass Spectral Analysis of Luteinizing Hormone Releasing Hormone” Proceedings of the 44th ASMS Conference on Mass Spectrometry and Allied Topics, 1996, Portland, OR. Solouki, T.; Reinhold, B. B.; Costello, C. C.; O’Malley, M.; Guan, S.; Marshall, A. G. “Structural Analysis of Polysaccharides and Peptides by MALDI FT-ICR Mass Spectrometry” Proceedings of the 44th ASMS Conference on Mass Spectrometry and Allied Topics, 1996, Portland, OR. Solouki, T.; Emmett, M. R.; Guan, S.; Marshall, A. G “Presence and Location of Disulfide Bonding in Biologically Active Peptides/Proteins by Multistage Fragmentation: A MALDI FT-ICR Mass Spectral Analysis.” Proceedings of the 44th ASMS Conference on Mass Spectrometry and Allied Topics, 1996, Portland, OR. Vining, A.; Li, G. Z.; Solouki, T.; Guan, S.; Marshall, A. G.; Vincent, J. B. “Characterization of Low Molecular Weight Chromium Binding Substance by Matrix-assisted Laser Desorption Ionization FT-ICR Mass Spectrometry” Proceedings of the 44th ASMS Conference on Mass Spectrometry and Allied Topics, 1996, Portland, OR. Solouki, T.; Paša-Tolić, L.; Marshall, A. G. “Structure Elucidation of Peptides by Two-Dimensional FT-ICR Mass Spectrometry” 27th Southeastern Magnetic Resonance Conference, 1995, Tallahassee, FL. Solouki, T.; Paša-Tolić, L.; Marshall, A. G. “Structural Mass Spectrometry of Peptide Mixtures by Two-Dimensional FT-ICR MS” 62nd Southeast Regional American Physics Society Meeting, 1995, Tallahassee, FL. Solouki, T.; Paša-Tolić, L.; Guan, S.; Jackson, G. S.; Marshall, A. G. “Peptide and Protein Analysis by MALDI FT-ICR MS” 9th Symposium of the Protein Society, 1995, Boston, MA. Solouki, T.; Ross, C. W. III; Paša-Tolić, L.; Marshall, A. G. “Structural Elucidation of Peptides by Two-Dimensional FT-ICR Mass Spectrometry”Proceedings of the 43th ASMS Conference on Mass Spectrometry and Allied Topics, 1995, Atlanta, GA.
Solouki, T.; Paša-Tolić, L.; Jackson, G. S.; Guan, S.; Marshall, A. G. “Peptide Mapping and Sequence Analysis by MALDI FT-ICR Mass Spectrometry” Proceedings of the 43th ASMS Conference on Mass Spectrometry and Allied Topics, 1995, Atlanta, GA.
Solouki, T.; Guan, S.; Marto, J. A.; White, F. M.; Marshall, A. G. “Attomole Biomolecule Detection by Remeasured MALDI FT-ICR Mass Spectrometry”Proceedings of the 43th ASMS Conference on Mass Spectrometry and Allied Topics, 1995, Atlanta, GA.
Solouki, T.; Gillig, K. J.; Russell, D. H. “Various ICR Cell Geometries in MALDI/FT-ICR Experiments: Theoretical and Experimental Investigations” Proceedings of the 42nd ASMS Conference on Mass Spectrometry and Allied Topics, 1994, Chicago, IL. Gillig, K. J.; Solouki, T.; Russell, D. H. “Chemical Reactivities of LASER Desorbed Radical Cations of Matrix Compounds Toward Model Peptide Molecules” Proceedings of the 42nd ASMS Conference on Mass Spectrometry and Allied Topics, 1994, Chicago, IL. Solouki, T.; Russell, D. H. “How Do Mixed Matrices Help Ion Detection in Fourier Transform Ion Cyclotron Resonance Mass Spectrometry” Proceedings of the Pittsburgh Conference, 1993, Atlanta GA.
Solouki, T.; Russell, D. H. “Ion Trapping and Ion Detection Conditions for Matrix-assisted Laser Desorbed Ions in FT-ICR MS” Proceedings of the Pittsburgh Conference, 1993, Atlanta GA.
Russell, H.; Solouki, T.; Lewis, T. L. “New Generation of High-Performance Tandem Mass Spectrometers for Environmental Chemistry- Tandem Magnetic Sector Time-Of-Flight and FT-ICR” Proceedings of the American Chemical Society (ACS) National Meeting, 1993, Chicago, IL. Oriedo, V. J. B.; Solouki, T.; Russell, D. H. “Gas-Phase Ion-Molecule Reactions of Atomic Transition Metal Ions with Polar Organic Molecules: Ground Versus Excited Electronic State Reactions” Proceedings of the 41st ASMS Conference on Mass Spectrometry and Allied Topics, 1993, San Francisco, CA. Solouki, T.; Oriedo, V. J. B.; Russell, D. H. “Gas-Phase Ion-Molecule Reactions of Peptide Ions with Small Neutral Molecules” Proceedings of the 41st ASMS Conference on Mass Spectrometry and Allied Topics, 1993, San Francisco, CA. Edmondson, R. D.; Kinsel, G. R.; Preston, L. M.; Murray, K. K.; Solouki, T.; Russell, D. H. “Using Clusters as a Tool to Probe MALDI Mass Calibration” Proceedings of the 41st ASMS Conference on Mass Spectrometry and Allied Topics, 1993, San Francisco, CA. Solouki, T.; Russell, D. H. “Trapping and Detection Conditions for Matrix-assisted Laser Desorbed High Mass Ions in FT-ICR MS” Proceedings of the Pittsburgh Conference, 1992, New Orleans, LA. Solouki, T.; Oriedo, V. J. B.; Russell, D. H. “Structural Mass Spectrometry in Matrix-assisted Laser Desorption Ionization with Ion Detection by Fourier Transform Ion Cyclotron Resonance Mass Spectrometry” Proceedings of the 40th ASMS Conference on Mass Spectrometry and Allied Topics, 1992, Washington D.C.
Oriedo, V. J. B.; Solouki, T.; Strobel, F. H.; Morgan, S.; Russell, D. H. “Characterization of the Extend and Relative Abundance of Excited State Transition Metal Ions Produced by Various Methods” Proceedings of the 40th ASMS Conference on Mass Spectrometry and Allied Topics, 1992, Washington D.C.
Solouki, T.; White, M. A.; Moses, M. E.; Strobel, F. H.; Beeler, L. R.; Russell, D. H. “Matrix-assisted Laser Desorption with FT-ICR Mass Spectrometer” Proceedings of the 39th ASMS Conference on Mass Spectrometry and Allied Topics, 1991, Nashville, TN.